This album is the product of Buzz Works and Nox Arcana and is an exploration of the theme of a zombie apocalypse. This is the first album I have heard which Nox Arcana has worked on that I can say I highly recommend. My favorite Nox tracks are usually their all too brief sound fx tracks. 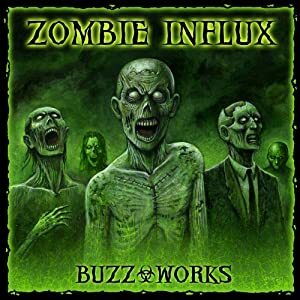 Zombie Influx is full of spooky fx and dark ambient music. 1. Dark ambient music with sound fx, my favorites off the album. Music is minimal and you almost never think you’re listening to someone playing the keyboard. These make up the majority of the album. 2. The more traditional Nox Arcana sounding tracks, heavy on keyboard driven melodies (that might use “voices” of other instruments, but its usually obviously done on the keyboard). I’m not usually that into these tracks, however I feel there is an improvement on this album. 3. Fake government broadcasts about the present situation. These could be strategically used during your game if you so choose. They actually sound pretty good, in my opinion. There’s only a few of these.